In July 2010 our 10 year old daughter was diagnosed with a tumor in her face/neck/head. This is not the sort of news any parent needs to hear. She had her next MRI scheduled for beginning of November which would show us if it had grown. In November we had her back to the hospital as her jaw was not healing where they had broken it so she then went back under to have the maxillofacial surgeons repair it again. Surgery was successful and we were home two days later (minus a few teeth and a little less jaw bone) the teeth and jaw will be fixed further down the track. On the 21st of December Emma complained of a lump appearing in her temple. Both Stuart and I were hopeful that it was just a hematoma or something similar but deep down I think we both knew what it was. Emma went in for a biopsy the following day. Results would not be available until after Christmas so at least we could get through Christmas in denial and thinking all is OK. It is a tumor again...It has grown back to 70% of its original size within 6 weeks. They are not going to operate this time as they would prefer to see if chemotherapy would work. She was due for her first treatment on January 5th, just one day after her 11th birthday. The treatment had been going well and Emma did not suffer any major side effects apart from the odd feeling of nausea. She had 8 weeks of chemo when she noticed a lump in her cheek. Yep you guessed it, here we go again! They took another MRI and confirmed that the tumour had now moved down into her cheek, which meant that the current chemo was not working. 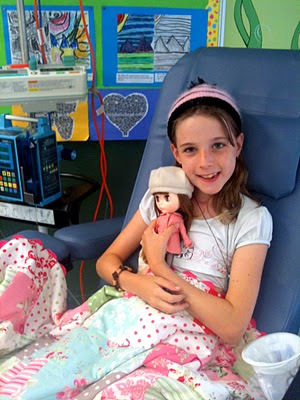 On the 7th of this month Emma was admitted to the Royal Children’s Hospital where she underwent a stronger dose of chemo. This one is given to her once a day for 4 days per month and will last for a total of 5 months. Both of the chemicals that she will be receiving list hair loss as the most common side effect. She has started to lose a tiny bit and has already picked out the wig that she wants. She is a tough little girl and is hoping that if we all get together we can make heaps of beanies and or bandanas, that we can donate to the Hospital. They do have a few but they are very old fashioned and not very appealing to children. Emma wants to see fun bright colourful funky ones for the children to pick from. Thank you for posting this. Makes me realize how good my life is. I am sending that little angel a treat. your permanent web address for your website. I just could not go away your site prior to suggesting that I actually loved the usual information an individual supply in your guests? on the markets, is also selected automatically. that features an ornamented mid-abstract thought or add an taking whang.